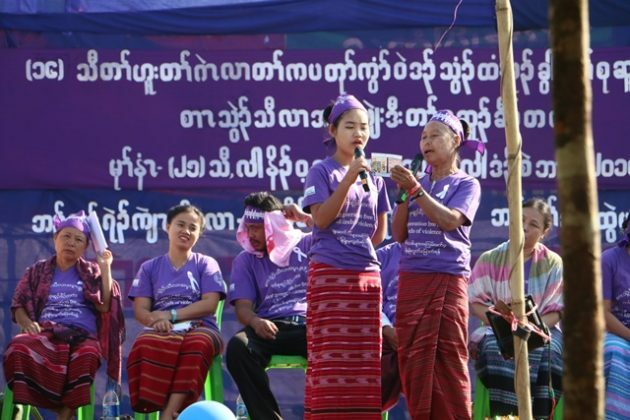 To mark the International Day for the Elimination of Violence against Women that falls on November 25, the Karen Women Organization (KWO) launched 16 days of activism with event held at Lay Ger Kler, Ta Mo Daw (Kyauk Taung) village in Thaton District, Karen State. Under the banner of a ‘Future Generation Free from all forms of Violence’ the KWO launch its campaign with KWO district representatives and from refugee camps on the Thai Burma border. Naw Dah Mu, a social welfare coordinator and an executive member of the KWO told Karen News the groups had come together to support the campaign. As many as 500 people joined the event to listen to speeches given by women activists on the 16-days activism, the causes of violence and women rights. Prior to this event, on November 24, sport competition was organized for women and children where officials from the Karen National Union’s Thaton district, together with local villagers joined the event. Padoh Saw Soe Myint, KNU’s Thaton District secretary joined the event and told Karen News he credits KWO for their efforts in raising awareness among the community about the issue and there have already been positive results in his area. Among the attendees, were 41 women who had served as village leaders during the armed conflict who witnessed violence committed against women. Naw Mu, a village leader from Doo Pla Ya district spoke to Karen News. Similar events to mark the day were also held in Hpa-an, Karen State. These were jointly organized by the Local Resource Center-SRC and civil society organizations based in the areas. The Hpa-an event was attended by the State Pa’O Ethnic Affair Minister, officials from government departments and representatives from international organizations based in the region.